After shopping at the Treasure Trove shop, we headed back around to go through the Treasures exhibit. The exhibit was nice and empty considering it was still only about 10 minutes after the Expo opened for members and people were mostly downstairs for the Arena or maybe had just done it yesterday already. This was our favorite part of the Expo mainly because there were no crowds to deal with, but also it was set up with more space to move around than most other exhibits/stores. 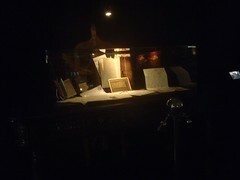 The exhibit featured a variety of props from Disney movies and shows. Our favorite part was the props from the National Treasure movies. 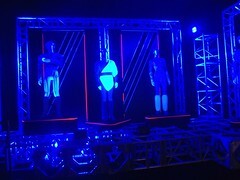 We also liked the Tron area, but thought it would have been cooler with the motorcycle or maybe a lightcycle. 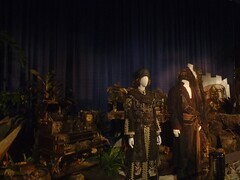 The props from the Pirates of the Caribbean movie were also interesting, but the they had a much larger exhibit of the 4th movie props in the main exhibit hall. Other movies/shows represented included Hocus Pocus, Zorro, Rocketeer, Lost, and Roger Rabbit.